"Constellations are stories in the night sky, the tales we tell to transform the abstract patterns of distant stars and planets into comprehensible shapes. Constellations explores our human desire to create narratives, and the ways in which abstract sonic and visual materials intersect with storytelling. The fifteen movements of the work are seeded with a multiplicity of relationships, inviting each listener to construct their own chronicle of the experience." Constellations encompasses an enormous variety of sonic and musical approaches. The music ranges from subtle studies in the variation of snare drum rolls, through meditative contemplations of the resonance of gongs and almglocken, to driving, polyrhythmic grooves created with vibraphone and woodblocks. Thunderous drumming, delicate and ethereal keyboard textures, and investigations of nontraditional percussion instruments such as glass tiles and whiskey bottles are all integrated into the music. Constellations also uses visual materials to construct narratives. The percussionist deploys triangles, gongs, and crotales as tools for shadow puppetry. Choreography features prominently in movements for rainsticks, and for multi-percussion. Projected digital animations grow increasingly elaborate of the course of the composition, evolving from simple triangular forms to darting, organic figures and complex, patterned mosaics. And computer- controlled lighting makes color and shadow into integral elements of the experience. Constellations is presented without intermission and has a running time of approximately 75 minutes. The work was premiered at the Big Ears Festival in Knoxville, TN, on March 24, 2017. Photo credit Fistful of Tigers. Christopher Burns is a composer and improviser whose works collage and layer musical trajectories, creating imaginative juxtapositions and innovative forms. His music embraces complexity and clarity, incorporating densely braided, rapidly shifting materials alongside gradually evolving, linearly directed textures. 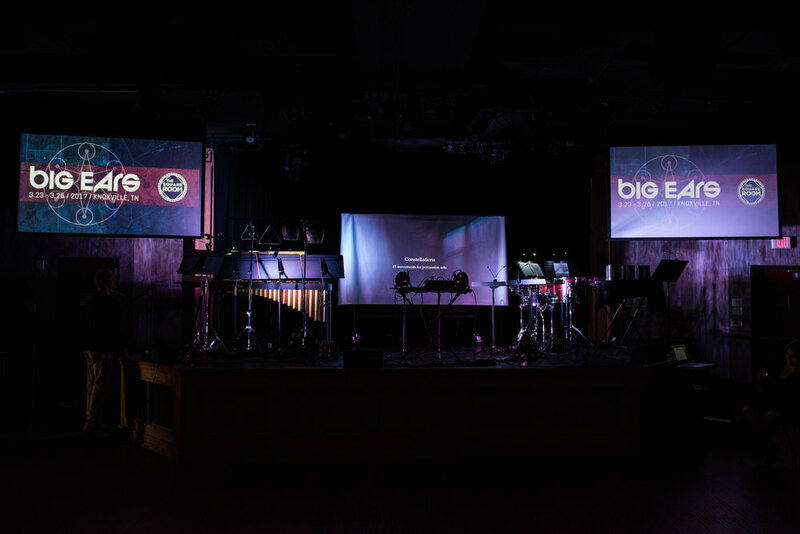 Recent projects add digital animation, video, choreography, and motion capture into this mixture, integrating performance, sound, and visuals into a unified experience. Christopher's work as a music technology researcher shapes his creative output in both electroacoustic and instrumental chamber music. He writes improvisation software that explores a variety of unconventional musical interfaces, and facilitates the performance of multilayered electronic textures. In the instrumental domain, he uses algorithmic procedures to create and elaborate distinctive pitch and rhythmic structures. Christopher is also an avid archaeologist of electroacoustic music, creating and performing new digital realizations of music by Cage, Ligeti, Lucier, Stockhausen and others. His performance of Luigi Nono's La Lontananza Nostalgica Utopica Futura, made in collaboration with violinist Miranda Cuckson, was named a "Best Classical Recording of 2012" by The New York Times. Christopher teaches in the Performing Arts Technology department at the University of Michigan School of Music, Theatre, and Dance. Previous affiliations include a teaching post at the University of Wisconsin-Milwaukee (2004-2015) and Technical Director of the Center for Computer Research in Music and Acoustics (CCRMA) at Stanford University (2003-2004), where he completed a doctorate in composition in 2003. He has studied composition with Brian Ferneyhough, Jonathan Harvey, Jonathan Berger, Michael Tenzer, and Jan Radzynski. Christopher has extensive experience as a concert producer. He co-founded and produced the strictly Ballroom contemporary music series at Stanford University from 2000 to 2004, directed the Unruly Music series at UW-Milwaukee from 2006 to 2016, and has served as a contributing director for the sfSoundGroup ensemble in the San Francisco Bay Area since 2003.
mallets, sticks, multi-rods, triangle beaters, etc.